We really appreciate what this company does in bringing quality products to the market at a reasonable price. It was no different this time around with the CBDistillery CBD vape juice, which is more cost effective than their disposable CBD vape pens and thus scored higher overall. After trying their vape pens, next on our list was the CBDistillery CBD vape juice. It comes in bottles of 1000mg and in a number of flavors. Is this product another winner from CBDistillery? With a base up in Colorado, three CBD users set out to help spread the gospel only back in 2016. From back then when CBDistillery was launched, to where it is today, is an impressive journey. While remaining committed to CBD and social causes, this company produces some great products. Make quality CBD products and people will by, and that’s exactly what happened. While their entire CBD line is popular, there is a special connection to the vapor world. 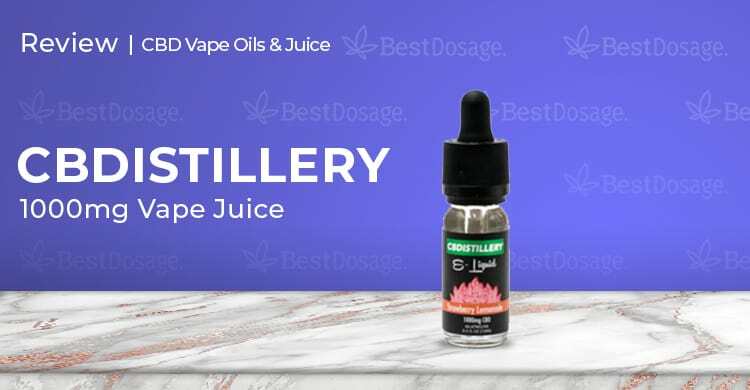 CBDistillery CBD vape juice is one of many vapor products, each containing pure CBD isolates in a base of triple distilled MCT, which is fractionated coconut oil. That, of course, means there is neither propylene glycol (PG) or vegetable glycerin (VG) in their vape products. They sell 15ml bottles that contain 1000mg of CBD and come in the following flavors: Grand Daddy Purp, Strawberry Lemonade, Grape, and GG#4. We received the CBDistillery CBD vape juice 1000mg bottle rather quickly after ordering it, and we first noticed it was packaged well. It’s a small bottle since it’s only 15ml, so the lettering on the label was a little difficult to read. All the information is available on their site, however, along with 3rd party test results, so it wasn’t a huge deal. The bottle was sealed tightly, but after opening it we got our first whiffs of scent at the Grand Daddy Purple CBD vape juice. It was subdued, yet incredibly enticing. Notes of grape and berry hung in the air close to the bottle, but otherwise, the smell was rather discreet. We filled our vape pens and instantly fell in love with this flavor. It really brought us back to good times, but now without the THC. The vapor created was nice if on the smaller small, but that is to be expected from an MCT base with no PG or VG. At 1000mg for 15ml of CBDistillery vape juice, you’ll want to start slowly at first. Having a puff or two and waiting a little while to see how you feel is advised. Vaping is one of the quickest in terms of CBD taking effect, so you’ll know soon if you need more. Depending on what you are using CBD for, it may be enough to take a couple puffs three times a day. Monitor your progress and adjust accordingly. Our CBDistillery CBD vape pen review (link) prepared us pretty well for what the CBDistillery CBD vape juice might be like. This is the same type of CBD vape oil in their pens, so we weren’t surprised when we achieved similar results. For those of us using it for anxiety, it hit us almost immediately and helped. For pain, it underperformed some but taking more puffs could very well do the trick. Those of us who needed help with insomnia felt a difference too, but not everyone liked vaping just before going to bed. High-quality CBD oil, triple distilled MCT (fractionated coconut oil) and natural botanical Grand Daddy Purp terpenes (or natural flavoring such as strawberry lemonade in other flavor options). We’ve never had a problem with CBDistillery’s customer support. They offer email and live chat as ways to reach them if you need. We have heard of some dead vape pens some customers received, but the support team quickly replaced them. $50 for a 1000mg bottle. The particular flavor we chose is popular, but we’ve heard their other flavors are just as good. The only thing we could complain about is the average vapor production, but that’s not such a huge deal when vaping CBD. The more important aspects are the effect and the flavor, and in those departments, this one is a winner.